I’ve been known to say this before, so I risk repeating myself, but I am generally of the opinion that most restaurants have really similar and generally fairly boring dessert menus. There’s usually a chocolate cake, a crème brûlée, a cheesecake and a limited selection of ice cream. Therefore now I quite regularly pay up after my main meal and head somewhere else for pud. With lots of specialist ice cream shops and bakeries now open late into the evening they make the ideal after dinner dessert and coffee stop off. 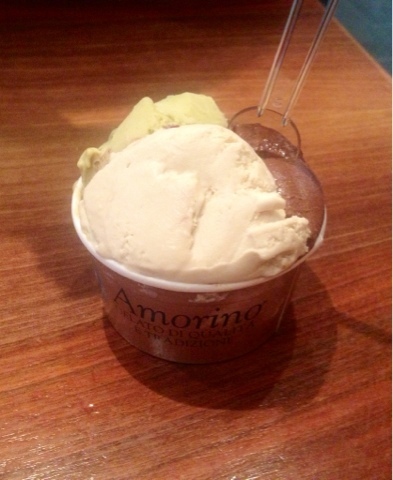 This week I went to Amorino on Old Compton Street. 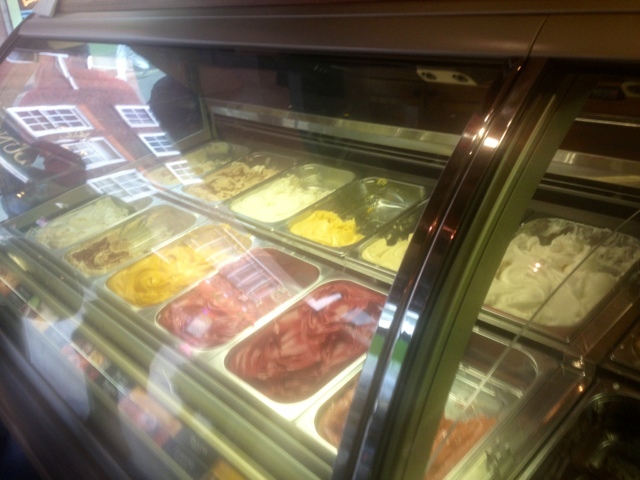 One of the great things about Amorino is that you pay for your cone or cup and then you can pick and choose as many flavours as you want rather than paying per flavour. There’s a huge variety of flavours and one of the things that struck me is how helpful the staff are and they all seem to have a great knowledge of how the ice cream is made and exactly what’s gone into each one. I had the Cioccolato Amorino alongside a scoop of hazelnut and a scoop of pistachio. There were about four different kinds of chocolate ice cream on offer and the friendly girl at the counter let me try each one, explained the differences between them and made recommendations. Exceptional service like this really takes the simple concept of an ice cream parlour to the next level. Also if you opt for a cone the staff sculpt the ice cream into a beautiful flower design, a brilliant touch.